Welcome to the sixth edition of MAMA Boards, an AppsFlyer video project featuring leading mobile marketing experts on camera. For today’s mini whiteboard master class, we have Katerina Zolotareva, Marketing and Customer Success Manager at TheTool, a leading performance-based app store optimization provider. 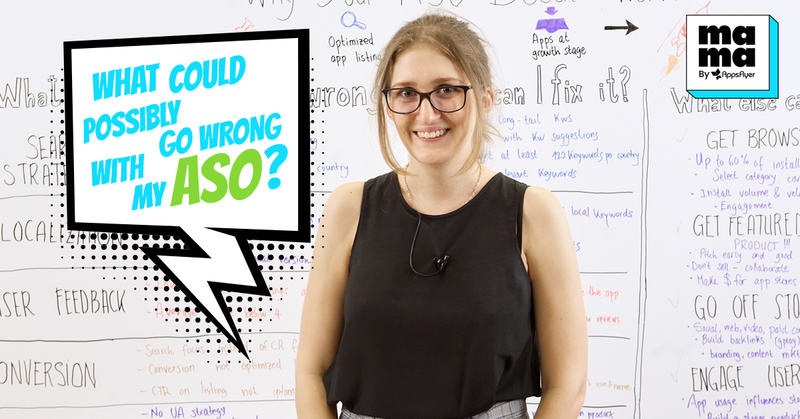 Katerina discusses the top five most common challenges facing marketers in App Store Optimization (ASO), and offers the most effective tips for overcoming them and enhancing your app’s discoverability. Hi, everyone, and welcome to another edition of MAMA Boards by AppsFlyer. My name is Katerina, I’m from The Tool and since last year, we have been helping over 10,000 mobile developers improve their ASO strategy and increase their downloads. 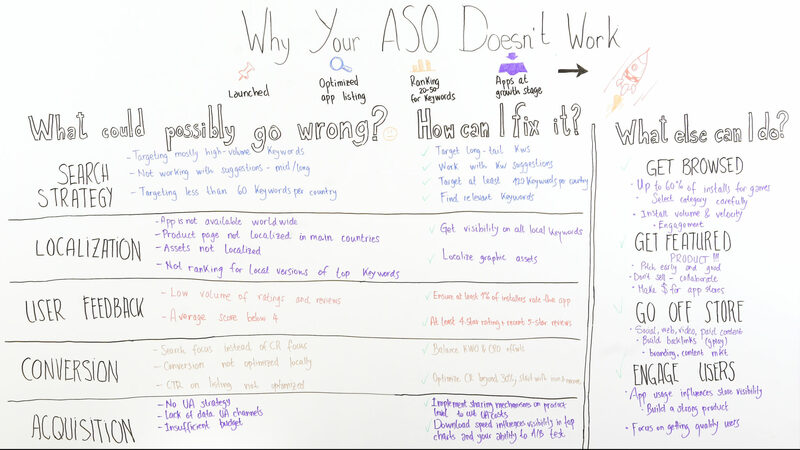 Today, we are going to talk about why your ASO strategy may not be working. App store optimization (ASO) is a basis of any mobile marketing strategy – however, it can be pretty challenging. That’s why I’m going to talk about five key areas where your app store optimization can go wrong and how to fix these areas. I will also give additional tips on how you can improve your discoverability in and out of the app stores. Which five areas do marketers find most challenging with app store optimization? How can I overcome these? So, the app has been launched, you have done the initial optimization of the product page, possibly already ranking among the top 20 or 50 positions for some of your keywords, and in general, your app is at the growth stage. But… how do you unlock the real growth and skyrocket your app downloads? What could possibly go wrong with your app store optimization strategy? Today, I’m going to cover the five most important elements of your app store optimization strategy which are search, localization, user feedback, conversion, and user acquisition. Search is one of the pillars of a solid ASO strategy, but many developers and marketers are making the same common mistakes here. One of them is targeting mostly high-volume keywords, not working with keyword suggestions and long-tail keywords, and in general, targeting too little keywords for the project – let’s say, less than 60. Well, data from Google Play organic installs shows us that 60-75% of the keywords that are bringing installs to mobile apps are actually long-tail. Moreover, 15-20% of them are derived from suggestions, so working with keyword suggestions is one of the most efficient strategies in improving visibility in search. Think about it – whenever there are suggestions, there will also be traffic for those particular keywords. Additionally, target at least 120 keywords per country and work with relevant keywords. Relevant keywords can improve your conversion rate on the lists and search page, as well as bring attention more efficiently to user needs. The next important element is localization. You won’t believe how many app developers are not making their app available worldwide. Why? Well, they think that if the content of the app is not translated, there’s no reason to also localize it. That approach is completely wrong. If the product page is not localized in the major countries [for your app’s vertical], how will you ever know where the demand for your app is coming from? In case you are currently localizing the product page, you can still make two main mistakes. The first is not localizing the graphic assets of the product page and the second is not ranking for the local versions of your top keywords. Localization should be treated as a separate optimization process. You should do the keyword research for the target country and try to get visibility on all the local keywords, not just doing a blind translation. As for the graphic assets, remember that they are user facing, so try to adapt all maps, calendars, and other elements that will make the users feel that this app has been developed correctly for them. User feedback is critical to your app store optimization strategy, first, because it affects your ranking on the app stores and, second, because it has a huge effect on your conversion rate. The main points here are having both a low volume of ratings and reviews, and an average score below 4. Let’s see how can we fix this. The solution is to ensure that at least 1% of the users who download your app rated. Since the app stores are giving more and more prominence to the user feedback on the product pages, you should ensure that you have at least a 4-star rating and a lot of recent 5-star reviews because this is what will encourage the new users to download and try your app. Conversion rate is another important element of your ASO. However, many marketers and developers are focusing too much on search optimization efforts and forgetting about the conversion rate, however, the same text that you are using to optimize the keyword visibility will be user facing and the users will actually read this text and get encouraged or discouraged by it. Additionally, if you don’t optimize your conversion locally, you’re missing a lot in the localization part. Also, when you focus too much on optimizing the conversion, you are often forgetting about the click through rate on the search result page. First of all, we always need to remember to balance keyword optimization and conversion rate optimization efforts. Try to optimize your conversion rate to reach beyond 30% and start with separately A/B testing your app name and icon, as those are the most important elements of the app store profile. As for the conversion, solve this with the click through rate. Lastly, we have user acquisition. It is technically not part of app store optimization, but user acquisition and ASO definitely go hand in hand. Many developers simply do not have any acquisition strategy, either because of insufficient budgets or other reasons. Even if they do some acquisition campaigns, they are not collecting enough data about the campaigns to optimize them. Remember that the user acquisition is critical to the success of your app store optimization. Why? Because it gives you an additional boost and gives the velocity of downloads that is needed in order to get a higher visibility in the top charts. It also influences your ability to A/B test by driving more quality traffic faster. In case you don’t have enough budget to run a user acquisition campaign, simply start implementing sharing mechanisms on your product level and make it viral in order to cut user acquisition costs and collect more installs organically. So, what else can you do to improve your app store optimization and discoverability? A few things – first of them, get browsed. The Google Play organic installs report showed that the common belief that over 60% of the installs come from search is not always correct. In fact, for games, up to 60% of installs can actually come from browse, so look towards the top charts, category rankings, and relevant apps. For this, you should select your category carefully and then implement your user acquisition strategy. For the app stores, what matters most in order to boost your app higher in the top charts is the volume of installs, it doesn’t matter if they are organic or nonorganic. Therefore, it’s important to ensure your optimal volume and velocity of installs and the high engagement in order to succeed in browse. So, the second tip, try to get featured. Since the app store has introduced the new editorial look of the store with iOS 11, and now Google Play is following its lead, the only way that you can get featured is to work with the editors. The most important thing that you need to have is an original and truly great product which, unsurprisingly, should also make money for the app stores. When working with the editors, pitch early because it can take a few months. Pitch well and don’t sell the product to the editors – instead, try to collaborate with them in order to improve your chances of getting featured. The third thing that you can do is to actually go off-store. Think of improving your social presence, web presence, working with video marketing, and content marketing. Build a strong set of backlinks for your app that will also help you rank higher in Android apps. Think of the branding and content marketing strategies [you will need] in order to improve your off-store presence. Fourth and last, but definitely not the least, try to engage your users. It is a growing trend that app usage is actually influencing your visibility in the stores. To succeed in that, build a strong product and focus on getting high-quality users. So that’s it for today. Thank you for watching! If you have other tips or things to say about app store optimization, go ahead and leave them in the comments and if you want to watch other MAMA Boards, just visit the link below.